There is more to electricity than simply turning on a light switch. Since the creation of electric power in the 1800s, major technology breakthroughs have evolved that have become necessities for the human race, like: light bulbs, telephones, stove-top ovens, refrigeration, heat ventilation and air conditioning (HVAC), hot water heaters, washers and dryers, TV’s, computers, security systems, internet, LED lighting, and so on…These new conveniences have greatly improved our standard quality of life, and they continue to progress. None of this would have been possible without the formation of electric power. If we look at the entire electric power system in three parts, electricity is: (1) generated at power plants, (2) transmitted over transmission lines, and then (3) distributed to the end users or customers. Electric power is generated as three phase alternating current (AC) by turning mechanical turbines from the forces of water, steam, or other means in order to turn generators, thereby, converting the mechanical energy into electric energy. In the US, the generators turn at 60 revolutions per second or at 60 hertz (Hz). As the generators spin, it produces such a flow of electrons that they must have a place to go. This flow of electrons travels on electrical conductors, such as, copper or aluminum. 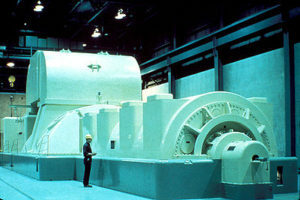 Shown below in figure 1, taken from Wikipedia’s “Electricity Generator”, it illustrates a modern steam turbine generator housed in a generating power plant. As generators rotate with its separate coils, stators, and rotors, it produces 3-phase power via a magnetic field with each phase angle in the sinusoidal power flow curves for phases A, B, and C that are equally spread apart at 120 degrees. The 3-phase power flow with phase angles at 120 degrees apart continues from generation to transmission to distribution and to the end power users. Both electric transmission and distribution are used to deliver the generated electric energy or electric power from one place to another. The transmission and distribution (T&D) systems transport or deliver power for different purposes. As the electricity leaves the generator, the voltage is stepped up with the use of step-up transformers located in what is known as generating stations or substations. After leaving the step-up transformer, the electricity is transmitted to power substations and ultimately distributed to end users. Shown below in figure 2, taken from Wikipedia’s “Electricity Grid”, it illustrates the generating station in red along with a generator step-up (GSU) transformer which shows all three phases of AC power. The blue color illustrates the transmission network to the substation and step-down transformer, and the green color shows the distribution network with three-phase or single-phase connections of AC power. Electric transmission plays the role of sending electricity over very long distances at very high voltage levels. Electric power is transmitted at higher voltages to limit the power losses that can occur in long distance transmission lines. Power can be transmitted across states, from one side of the country to the other, or across different countries. 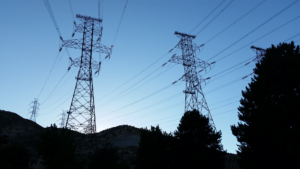 Electricity is transmitted over transmission lines suspended in air on very tall transmission towers with large insulators in order to maintain proper electrical potential clearances from the ground, structures, or phases. These transmission conductors are not insulated and are comprised of several steel-aluminum alloy strands. Transmission towers can house multiple circuits or multiple conductors. A particular tower can have one set of 3-phase transmission lines (A, B, and C phases) on one side and another set on the other side, ultimately, delivering two sets of 3-phase transmission lines. Figure 3 below shows a picture of a typical 3-phase transmission system with transmission towers and transmission lines. The electricity can be transmitted at various voltage levels. Typically, transmission voltage levels are at 60kV and above – 69, 115, 138, 161, 230, 345, 500, 765, etc. In order for electric transmission to take place, it requires voltage transformations at two substations, (1) the generation station (voltage step-up) and (2) the substation (voltage step-down) where distribution takes over. At generating stations, a GSU transformer is required to increase the voltage level for transmitting electricity over long distances. At the substation, there are step-down transformers for bringing the high voltage down to lower voltages for distribution uses. The electricity is carried across transmission lines where the electric power can flow both ways or bi-directional. This allows the electricity to flow from the supply side (generation) to the demand side (end users). Transmission lines can be buried underground in the form of insulated underground cables. Generally, these underground cables need less right-of-way (ROW) and less real estate compared to overhead transmission lines (TLs). Also, underground transmission is usually not affected by the weather like overhead TLs, but their installation costs are much higher compared to overhead transmission costs. Distribution electricity is delivered over distribution lines that are suspended in air at much shorter distances from the ground compared to transmission lines due to lower voltage levels. The electrical clearance distances to ground or per phase are much shorter due to the reduced voltage levels (reduced potential differences) compared to transmission clearances. The distribution conductors, if insulated, can also be buried underground. Distribution voltage levels are typically 60kV and below – 46, 25, 13, 4, 2, etc. Distributing the electricity to end users, such as: industrial facilities, manufacturing, commercial, retail, businesses and residential; requires shorter distances at lower voltage levels to limit large power losses with the impedances and higher current within the distribution lines. Distribution lines are much smaller than transmission lines. The end user (residential and small commercial) typically uses one phase of electricity, and the larger customers or users (large commercial and industrial) require 3-phase power for operating larger motors and machinery. The voltage levels sent directly to the smaller customers are generally single-phase AC and at 240VAC. Larger customers may require 480VAC or higher at 3-phase power. These smaller voltage levels are delivered to the end users by either pole mounted or pad mounted distribution transformers usually located outside the facility. These distribution transformers will step-down the voltage to 240VAC, 480VAC, etc., before insulated conductors enter the building or facility. 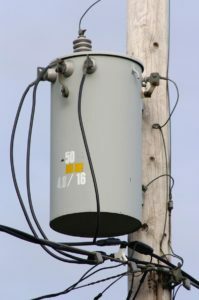 Figure 4 below shows a picture of a pole mounted, single-phase distribution transformer. The electric flow in distribution power circuits is generally one direction to the end user. With the push of renewables, distributed generation (DG), microgrids, and the implementation of smarter grids (the Smart Grid), this allows for bi-directional power flow on distribution networks. Simple power flow on radial lines has now become more complex with bi-directional power flows with the use of DG and smart grids (SGs). This will continue to be a challenge for distribution power utilities in changing their protection philosophy schemes from simple over-current protection against current shorts or electrical faults to differential, distance, and transfer trip schemes.